On March 10th I launched my second Tweetinar, “Social Media – The BIG Picture” based on Part Three of my book. This “Tweetinar” delivered social media insights three times a day, five days a week at 10:00 AM, 12:00 PM, and 2:00 PM, Monday through Friday, and runs all the way through SEPTEMBER!If you missed any of my first Tweetinar I will share those social media insights with you in each of two, bloginars. The fourth 60+ social media insights are below. Be sure to RSS this blog or check back soon for the final 60 tweets to complete your Five Steps To Social Media Success bloginar. Also remember to follow my tweets for more social media insights and the biggest Tweetinar yet! • Is your web address on your manilla return label? Are you trying to keep it a secret? 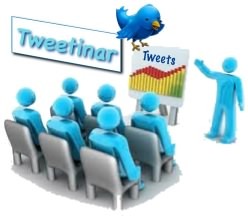 • Is your blog URL on your brochure, email sign-up in your Tweets? • Add your URL to your mailing label. The post office doesn’t care. Use all marketing real estate you can. • Every time you touch your customer / prospect you want to make it easy for them to find you! • How long did it take us to realize we need our web address and email on our business cards… Years! • It’s way to easy to think of social media as separate from our conventional media. It’s only new tools! • Make all your contacts available. Your customers / prospects will choose which one they like best. • It doesn’t matter if you don’t like Facebook. Marketing isn’t about you! • If a segment of your demographics like Facebook, you need to be there. • If a different segment prefers video, you need to be on YouTube. It isn’t about you. • Increasing Revenue isn’t a conversion strategy. It’s a end to the means. • Nearly ever conversion strategy eventually leads to increased revenue. • Why not ask your customers why they bought from you? Wouldn’t that have value? • Wouldn’t knowing what psychological hots buttons caused them to buy? • Find out! Create a conversion strategy that get you that information. • If you knew why your existing customers bought from you, you could do it again. • Ask your customers how you could make your product better. • If you made it better or created a new product they asked for, would they buy it? • Of course they would buy it! You simply asked what they wanted and provided just that! • Put your efforts into content not production. • A 30 second television commercial could cost $250k plus $1.2m to air once in major markets. • If you spend $1.5m, don’t you have a hidden agenda? You have to! • You need to make back in revenue, multiples of that $1.5m, or be fired! • You had better be hitting a lot of psychological hot buttons and calls to action. • These Tweets cost nothing. There is NO hidden agenda. Just good content. • People are aware of that. They want good content not polish or hidden agendas. • We all have moved from con-sumers to pro-sumers. • Step 4: Resources, the second most asked question. Where do we find them? • In the current economic climate we all are doing a lot more with much less. • The great part about social media is that it’s free! All media requires time to implement. • Print, direct mail, radio, trade shows, newspapers, trade journals, & television are VERY expensive! • The biggest obstacle in implementing social media is the corner office, the “C” Suite. • The “C” Suite: 50+ yo, responsible for developing the long & short term strategy. • The “V” Suite: 40 to 50 yo, responsible for developing the the tactics for the company. The 30 to 40 yo understands the technology, the 50+ has the experience and wisdom. • Marketing & PR are getting social media, Customer Service totally gets it! • Marketing & PR mostly push messages, while Customer Care has always been about two communication. • Two way communication is in customer care’s DNA. They understand the vale of communication. • If your social media effort is going to be successful, you MUST have management buy-in right to the top. • You will have to convince upper management of the value of social media. Here’s how. You have a responsibility to monitor those conversations about your brand & company. • You have a responsibility to manage your reputations. • If the conversations are good; leave a thank you, link to them, retweet them. • If the conversations aren’t good, rebut, explain how they author is incorrect. • ALWAYS take the high road! ALWAYS respond and never react. • If there is a negative comment, don’t you want to know about it before anyone else? • If it’s positive, reward the author; thank them and give them credit. • This immediate response encourages good conversation and defuses negative ones. • You need to respond first before the conversation gets out of control. • Remember: Your customers / prospects are demanding that you participate in these conversations. • If you’re not there, they will still talk about you and your company. Be there. • Try a limited campaign. Strategize, identify the tools, implement, measure, and report. • A successful campaign is the best examples of why a company needs to participate.